Not long ago, I was speaking at a blogging conference when a writer in the audience asked this question. And until recently, I didn’t have a great answer. Today, with an abundance of blogs and social media channels, it can be a bit daunting to even try to promote your work. Everyone has something to sell, and the desperation we all feel from the countless voices vying for our attention can just be a bit too much. So, how do we do good work and also help our work get the attention it deserves? But there’s a little secret great musicians, comedians, and writers know: the best way to promote your work is to just do the work. Comedian Chris Rock has a habit of showing up unannounced to small nightclubs. No one in the audience knows he’s coming. They haven’t bought a ticket to see him; they aren’t even aware of his performance until he’s onstage doing it. Often in front of audiences with fewer than 50 people, he takes the stage and goes through a 45-minute routine. Surprisingly, he isn’t very good. With a legal notepad in hand, Rock offers the material in an informal and un-exaggerated voice, seeing which jokes connect and which ones fall flat. This is far from the polished, outlandish version we are used to seeing on TV comedy specials. Most of the jokes fail, and that’s because he isn’t performing. He’s practicing. When he’s working on new material, Rock may do this 40 to 50 times in preparation for a big tour. At a small New Jersey club near his home, he’ll randomly walk in, take the stage, and proceed to bomb. He’s not doing his usual bits. Instead, he’s trying out his new material. Sometimes, it goes so poorly that people get up and leave. Other times, they fold their arms or laugh at him — not with him. Why does he do it? Why subject himself to such humiliation? Because Chris Rock doesn’t become Chris Rock by practicing his jokes in a dressing room. He does it by taking the stage and failing in front of an audience. The same goes for Louis C.K. or Steve Martin. This was how musician Beck Hansen began his career, as well, playing for audiences who didn’t want to hear folk songs in rock and roll clubs. There is no other way to get good than putting your work out there, sharing it for the whole world to see and hear. There is also no other way to get discovered than by submitting yourself to an audience, doing your best, and risking the inevitability of rejection. You must practice in public. I used to want to be a professional musician. After practicing the guitar in my parents’ basement for six years, I wasn’t much better than when I started. Oh, sure, I made incremental improvements but was nowhere near what you would consider proficient. But then, I joined a band. And we began playing shows, one after another, each time getting a little better. Then I started another band, and another. By the time I graduated college, I was on to my fourth band and first major tour. For a year, I traveled through North America in a van with six other musicians, sometimes playing several shows a day. During that time, I didn’t practice scales or runs or any of that stuff. I just performed. Day after day, night after night. And you know what? I became better than I ever thought possible. But perhaps more importantly than that, I wasn’t creating in a cave. I was building an audience while I built my craft. The truth is, you don’t do your best work at rehearsal. You do your best when you have to — when you’re on stage in front of a live audience, when the publisher is waiting for your manuscript, or when everyone is waiting for you to step up and do it. Not by talking about it or studying, but by actually doing the work. And when you do this, people notice. This is nothing new. It’s what Tim Grahl is doing by writing his book in public and having editor Shawn Coyne critique it each week on the Story Grid podcast. It’s the same thing Pamela Wilson and I did with the Zero to Book podcast. 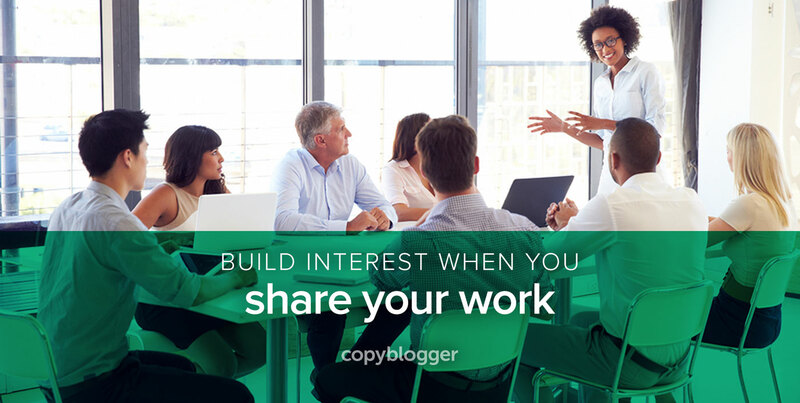 It turns out, the best marketing strategy is sharing your work while you do your work. Working transparently on a project out loud and in public is a great way to earn the attention of an audience. It works because people believe it. You’re baring your soul, risking everything. And even if you don’t succeed, people will be cheering for you. Of course, this means you will eventually fail. You can count on it. Recently, I had a book signing at a local bookstore, and five people showed up. Two were my son and wife, two were house guests who were morally obligated to attend since we were providing shelter for them that week, and one was a loyal friend who almost always comes to these types of things. At that point, I was tempted to whine. To complain. To moan until he felt guilty for not coming or so filled with pity that he bought a hundred copies of my book just to make up for it. But instead, I chose another route: gratitude. With every public disappointment, you have the choice to either give in to frustration or see such shortcomings as practice. In the words of Chris Rock, these failures teach us; they are our “training camp.” You can’t avoid these failures; they are a necessary step on the road to greatness. When we fail, we can re-envision our failures as training for what’s to come. This is not merely looking for a silver lining. It’s deeper than that. It’s a commitment to go on, to persevere, believing one setback will not defeat you. You’ll live to fight another day, and you will be better because of it. And today? That was just practice. For the big time. The next show, the next book, the next chance to do it better, when the stakes are even higher. And the sooner you get started, the more prepared you’ll be. There is no other way to get good — to do the work of a professional — than to stop waiting for a chance to share your work with the world and do it now. Years ago, I learned this lesson from Seth Godin when he said, “No one ever gets talker’s block.” You get better at talking the same way you get better at writing. You practice, and the best kind of practice happens in public. I can totally relate to what you wrote and especially point no 3, the fact that you learn how to deal with failure. This is still the thing that draws me back most of the times (the fear that I’m going to fail) and I’m working on it but I have a long way to go. Yep. One of the things I love about this concept is that failure is a part of the process. But the more practice we do in public, the more it takes the sting out of failure. Sure, we get better. But we also get used to failing and realize that it doesn’t kill us. Failure is rarely permanent. A few years ago I got the itch to write a book. I had been studying and performing comedy at Second City in Chicago for a few years at that point and had always wanted to write a dark comedy that had been bouncing around in my head for a long time. I sat down and wrote the first chapter in a night. It felt great. I was on my way. Fast forward a year, and that book still stood at one chapter. I was scared to do the work. I was scared that the next chapter wouldn’t be good. I was scared the book wouldn’t take shape. I overanalyzed the hell out of everything about it. So it sat. After a year, National Novel Writing Month (NaNoWriMo) came around and I saw it as an opportunity to really focus on the book for the month of November. I made a goal of writing 15,000 words per week. I could write anything. So that’s what I did. If I didn’t know exactly where the story was going I still wrote. Once the month was over, I had a 72,000 word novel done. Because I just sat down and did the work without overanalyzing it. Then, once you have it, you can decide what to do with it. Share it. Publish it. Promote the hell out of it. It can be any content – a blog post, a novel, a piece of Harry Potter fan-fiction where Hagrid plays all of the characters. It doesn’t matter. Just write. Love that. NaNoWriMo is a great example of practicing in public! It was a very nice article. Thank you. Perhaps you could mention a little overcome fear in front of the community. I developed a rule for myself in this regard. That is how I want to see myself. Does a man as trembling with fear? Or head upright, is the smile on his face as a monument to courage? Please mention something about comparison on public addressing vs virtual public addressing. I mean people feel fear to face public, and thatswhy they go to arrange webinars or other online video chatting type things. What do you say, how they overcome their fear of rejection? I think a lot of people don’t take into account that they will fail at some point. I see a lot of people act like they are superhuman and while that may work, failing teaches us so much. My best gains in life were due to failing! Thanks for sharing Jeff! What a great article for helping people work through their weakness and build on their strengths. Push yourself to the limit and keep going, that is not something that comes naturally to me. I have a tendency of hitting a wall and then instead of bouncing back I simply quit. I have always thought of an experiment gone wrong as a failure, but what if we were to think of a failed experiment as just an experiment, and we use the outcome to help guide our future decisions. This is both inspiring and terrifying, as I try to work harder on my work and feel I’ve barely started. As an introvert and shy person, opening my work out to an audience is terrifying, but what you write makes so much sense. it is completely truth that it is easy to be confident, have audience in public and i can have share my knowledge and prepare carefully to presentations. Do you have any books for preparing presentation ?